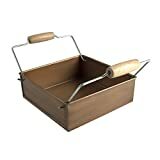 Clip the coupon to get this Masonware Antique Finish Copper Napkin Holder for a super low price! The Artland oasis napkin holder is a beautifully rustic and vintage designed holder for napkins, and other small items. It comes with wooden handles that add to the overall design and make it easier to carry. Use it on the patio or in the kitchen for napkins, or find another creative home decor use for it. Antique copper finishing makes this piece unique and will add style wherever it goes.